The Prinoth PANTHER T7R is set to redefine the standards for tracked dumper productivity and cost effectiveness. With its design and engineering guided from the ground up by Prinoth customers, the PANTHER T7R goes well beyond technological innovation, delivering both lower cost of ownership and the ability to get the job done. 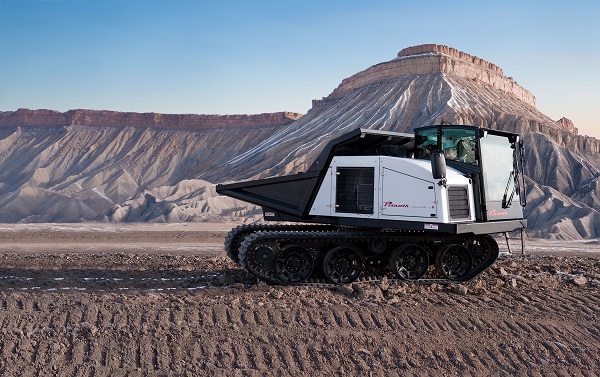 With considerable manpower, effort, research and an eager ear to the wants and needs of its customers, Prinoth set out as its objective the creation of new benchmarks for crawler carrier productivity. Prinoth’s innovative R&D gives the PANTHER T7R a payload capacity on par with the industry, and an impressive overall speed. Creating a machine with such an enviable low cost of ownership is no mean feat and required the rigorous application of Prinoth’s dedicated hands-on philosophy to planning, design, testing and refinement. This resulted into great advantages for owners. For one, this model’s fuel autonomy is considerably superior and will easily allow contractors to work through a whole day, even a long one, without needing to refuel. Additionally, the vehicle is also under 2.5 m wide, which complies with standard transportation regulations and thus saves companies money and makes transporting the vehicle from one site to another much easier. All told, owners and operators of the new Prinoth T7R will benefit from best-in-class productivity levels. Click here for more Prinoth news!